Notably, what started as a movement driven by startups and entrepreneurs looking to move out of their basement, garage or local coffee shop also is capturing demand from corporate occupiers who are moving individuals, business groups and even entire departments into co-working space that can accommodate on-demand flexible space needs. Green Street Advisors recently published a special report that highlights the headwinds and tailwinds co-working brings to the office sector. The study estimates that the growth in co-working will likely result in a cumulative reduction in demand for office space of 2-3% by 2030. The flip side is that co-working providers have been gobbling up office space as traditional tenants continue to consolidate and downsize. According to a research report by the Instant Group, there was an estimated 80 million square feet in co-working and flexible workspace in the U.S. at the end of 2017. Landlords and real estate service firms recognize what could very well be a secular shift in the market. They also see the huge mark-up that co-working firms are charging for space, and they want a piece of that pie. According to the 2019 Emerging Trends in Real Estate report, there have been several notable moves in the past year that include Blackstone buying a majority share in the Office Group and the Carlyle Group acquiring co-working company Uncommon. In early 2018, Newmark Knight Frank also made a strategic investment in Knotel, a third party firm that will find, customize and operate office space on behalf of their clients. And CBRE announced in October that it plans to launch its new co-working subsidiary, Hana, in early 2019. Essentially, Hana will serve as a third-party service provider that will work with both building owners and co-working space users. The Real Deal noted that, “In getting into the co-working business, the world’s largest real estate services company is betting that landlords want co-working components in their buildings, but not the hassle of managing them or the prospect of competing with their own tenants.” The article also noted that Hana will co-invest with landlords on the cost of building out co-working spaces, manage them and take a portion of the revenue. Convene is another firm that is partnering with landlords that include the likes of Brookfield and RXR Realty to design and service “the next generation office building” that feels more like a full-service, lifestyle hotel. The company has a workplace-as-a-service platform that uses technology to curate a growing network of meeting and event spaces and flexible workspaces. Convene announced two new Midtown Manhattan locations with strategic partner RXR Realty that opened in September, including a 116,000 sf space at 530 Fifth Avenue and 28,000 sf at 75 Rockefeller Plaza. Convene also signed an agreement with Brookfield in 2017 to bring flexible workplace solutions to the company’s properties in Downtown Los Angeles with a plan to expand that offering to Brookfield assets in other markets in the future. Yet landlords also need to be mindful of the downside risk. Although WeWork and Regus have emerged as dominant players, it remains a highly fragmented – and some would say even volatile business. According to the Instant Group, the top 10 operators control about one-third of the market. A downturn in the economy will likely put co-working to the test and result in a shake-out of weaker players. Another risk is emerging in some markets: there are some co-working locations that have opened which have slightly missed the mark, either in how the space is curated or the location. 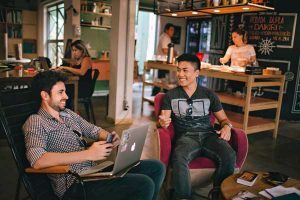 So, landlords and service providers that do decide to compete in the increasingly competitive co-working marketplace will need to be very dialed in to local market drivers.